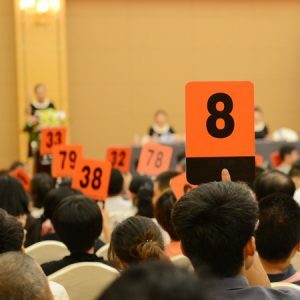 Planning on attending a live auction but unsure of the proper etiquette? Read on for some helpful tips so that you’ll be ready to start bidding! Only bid for items you really want to win. Try not to get caught up in the excitement and bid on something you’re not interested in knowing that someone will bid after you; it will only raise the price higher for the people who really want the item. If you respect other bidders, they will be more courteous when you place your bid on your item of interest. Like stated above, it’s rude and bad etiquette to bid just to raise the price. Bidding to hurt someone else’s bank account will only cause resentment. Know what you are willing to spend and conduct some research before attending the auction. This way you’ll be prepared with money in hand to get a good price on the item you want to bid on. This is especially important when it comes to real estate auctions where money may be due at the time of purchase or within the next few days. Often at auctions, sellers are nearby to witness what their items sell for. Don’t be disrespectful by bad mouthing the items. Smith & Co. Auction & Realty sells everything from farm machinery to 3100-acre ranches. Browse our upcoming auctions or give us a call at 580-254-3975 to learn more!